Personalizing things is one of the reasons a lot of us started embroidering. We add our names to towels, shirts, bags and just about everything that we can get underneath our embroidery hoop. 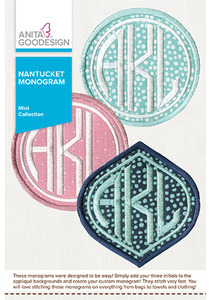 We have offered monograms in the past and we are excited to present our newest monogram collection titled “Nantucket Monogram”. In the 1980’s the preppy style of dressing was very popular and everyone monogrammed everything, so when we researched this collection we looked at quite a few pictures of New England preppies and designed these wonderful 3 letter monograms. They were designed to be easy! Simply add your three initials to the applique backgrounds and create your custom monogram, they stitch very fast. 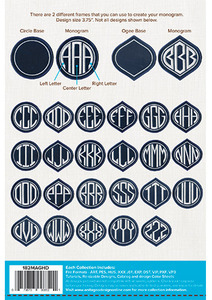 You will love stitching these monograms on everything from bags to towels and clothing!